Smoky eye makeup is very trendy right now. This holiday collection looked tempting so I wanted to give it a try. These beauty sets only come out once a year. And it was time to buy a special set for me. I wanted this collection to come with a diagram or directions to demonstrate how they achieved their smoky eye shown in the box photo – but it didn’t. So, let me tell you what I did and you’ll see the results below. I used mascara first. I like to wipe off any smudges before applying eyeshadow. The mascara applied just fine, a little on the light side. But, this is a small bottle and not a full-size mascara. So, for this set, I think the mascara will run out first. The eyeshadow primer was very smooth and velvety. It came out light skin-colored, but it didn’t show that light color on the skin as it was rubbed in. The eyeshadow looked so glittery and was one of the reasons I liked the set. But as I put it on, the glitter started spreading on my model’s cheeks. As I applied more, I realized the glitter was just on top of the eye shadow and would be less next time. The first coats applied very thinly. To get through the glitter layer, I had to press many times to get the amount of color I needed. I applied the lighter colors on the eyelid closest to the nose. I used darker colors as I went outward, all the way to the brow. The darkest gray color also went on the back crease of the eyelid. The eyeliner pencil glided on easily and smoothly. But, the collection did not come with a pencil sharpener. On the top eyelid, I used the liquid eyeliner. I really liked how thin the brush was. It went on smoothly and was easy to control. The lip glosses were thick and a solid color. I started with the red. But it was a bit overwhelming for me so I gave it a gentle blot. Then I put the tan color on top. I was able to get the look of the model on the box. I really liked all of the products except the mascara could have been thicker. The color was the same in darkness. But it photographed lighter. For normal use I’d leave out the darkest color on the eyeshadow. And also not use it below the eye – to save that for a nighttime look. My model loved getting to wear such adult makeup – she looked good. We had a lot of fun making her up, but she is not ready for adult makeup, just yet. 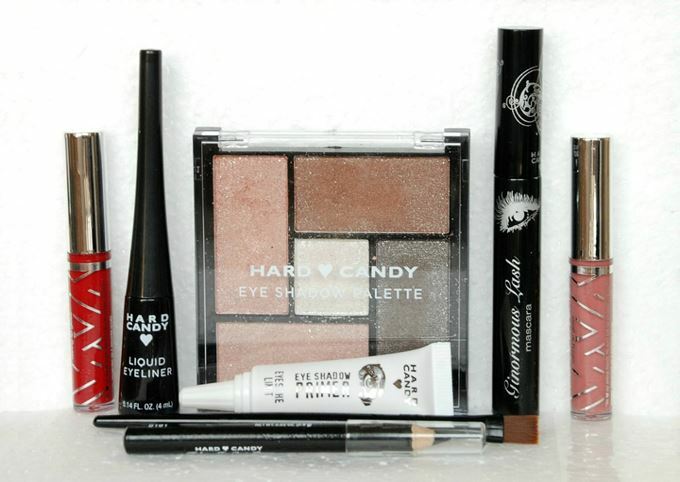 So, go and scour the Christmas beauty sets. There’s a good chance you’ll find something that Santa – hint hint – should buy for you. « Christmas Decor – Reindeer, Snowmen, Santa!